Or as my twin sister often says : Farm to Fork! When you live in a big city, and time for good food is short, it is so nice to know that the good food can come to us. And it was quite by surprise that I saw a farm stand at my local train station in the middle of Paris, on my way home from work one recent evening in April. The store Les Poireaux de Marguerite, has branched out their activity to offer their products to people who are well out of the vicinity of their store (which is located at 51 rue Saint-Maur, 75011 Paris). The gruff yet charming Frenchman with the friendliest attitude attracted several of us passengers as we exited the train station. 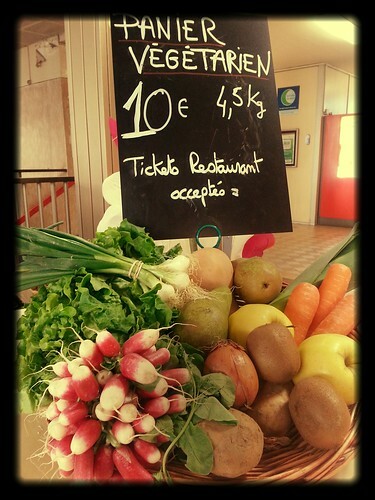 10€ for what they call the “Vegetarien” basket which is a heap of season fruits and veggies from the farms they work with. The in-store price seems to be 14€, and I am not sure why the slight price drop at the train station stand, but I am not going to protest!